A sea of Canon red. Over a thousand photography-loving Filipinos gathered at the recently held Philippine leg of Canon PhotoMarathon 2017. 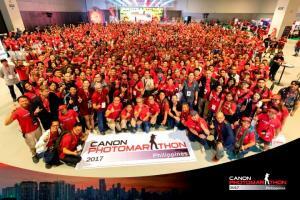 Manila, Philippines —Over a thousand photography-loving Filipinos gathered at the much-awaited Canon PhotoMarathon 2017. Armed with their Canon camera of choice, the participants showcased their best shots to earn the much-coveted spot at Asia’s largest on-the-spot photography contest. Ruben Ranin was declared the champion with his majestic photo of the Manila Cathedral set behind a flock of flying doves at noon time. He took home several Canon products with him along with the prize of an all-expense paid trip to Japan and the pride of representing the Philippines to the grand finals in Japan next year. Aside from Ranin, this year’s winners also included over-all 1st runner-up Beethoven Domingo, Theme 2 2nd runner-up Mark Dizon, Theme 1 2nd runner-up Katrina Garcia, Theme 2 3rd runner-up Johann Nino Mari Abi-abi, and Theme 1 3rd runner-up Robert John Garcia. They all took home several Canon products and special prizes from the event sponsors.